The Carnival Breeze's Winner's Luck Casino is located on Promenade Deck (Deck 5). 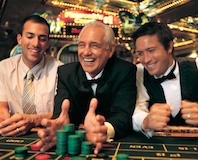 Carnival Breeze's casino games include Slots, Blackjack, Craps, Roulette, Bingo, and Texas Hold'em Poker. The Carnival Breeze has a progressive jackpot system on their slot machines with payouts that have reportedly reached over one million dollars. The casino typically operates any time the ship is in international waters. Gaming lessons are offered at the beginning of the cruise and the Carnival Breeze's casino staff is always willing to answer your questions if you are trying to learn a new game. The Carnival Breeze has Texas Hold'em tournaments. There is an entry fee required for the Texas Hold'em tournaments on the Carnival Breeze. Check with the casino staff for the times of the tournaments. If you are a frequent gamer, consider joining the Carnival Players Club. You receive points when you play the slot machines. There is no need to sign-up, just keep your Sail and Sign Card (your room key) in the slot machine's electronic reader while you are playing and you will start accumulating points. Every time you accumulate 1,000 points, you get a $10 instant cash reward. If you're playing at the tables (Blackjack, craps, etc. ), ask the table games supervisor about the minimum play criteria and benefits. Generally speaking, the benefits include complimentary drinks while playing, great offers on future cruises, invitations and offers to special events and tournament cruises, VIP cruises and lines of credit for high rollers. If you need to contact the Carnival Players Club, e-mail playersclubfeedback@carnival.com.